The prestigious Gifford Lectures bring together notable scholars to discuss natural theology. 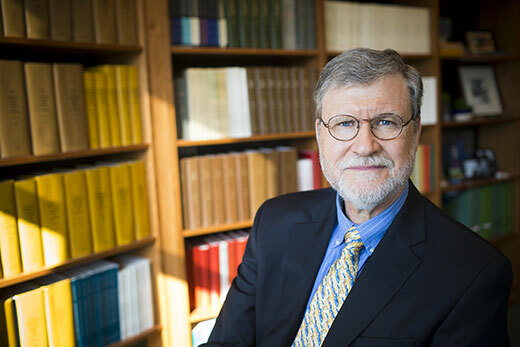 Robert N. McCauley, founding director of Emory’s Center for Mind, Brain and Culture, will address cognitive science and religion, an interdisciplinary field he pioneered. Robert N. McCauley, the William Rand Kenan Jr. University Professor of Philosophy at Emory College of Arts and Sciences, has been invited to be a Gifford Lecturer at the University of Aberdeen in 2020-2021. The prestigious lectureships were established by Adam Lord Gifford (1820–1887), a senator of the College of Justice in Scotland, for notable scholars to deliver a series of public talks on “natural theology,” broadly construed as the knowledge of God. “I am humbled to be chosen as a Gifford lecturer in the light of the many distinguished thinkers who have preceded me in this role,” McCauley says of the invitation to lecture during the bicentennial of Gifford’s birth. Since their creation, the Gifford Lectures have become the foremost intellectual event in the confluence of science, religion and philosophy. Lecturers in a variety of fields give talks at the four ancient Scottish universities of Edinburgh, Glasgow, St. Andrews and Aberdeen. Scholarly luminaries such as philosopher Hannah Arendt and psychologist/linguist Steven Pinker have delivered past Gifford lectures. McCauley’s lecture will address cognitive science and religion, an interdisciplinary field that he pioneered before becoming the founding director of Emory’s Center for Mind, Brain, and Culture (CMBC). Specifically, his research concludes that religious explanations make intuitive sense by engaging our natural cognitive systems, while scientific thinking requires more abstract work. He has written or co-authored four books that helped start and broaden the scientific study of religious cognition. “He is well known for his high level of innovative scholarship into how our different ways of thinking and our natural tendencies lend themselves to religious practice,” says Lynne Nygaard, a psychology professor and current CMBC director. “This invitation is wonderful recognition for Bob, for the CMBC and for Emory’s commitment to understanding multiple perspectives on human behavior and thought,” Nygaard adds. McCauley will continue his regular teaching work and research until his lectureship. He is now finishing an intellectually provocative new book, examining similarities between the features of religious experience and mental disorders. Some of those findings may end up in his Gifford lecture, he says. “I hope to be able to share things that are not just provocative but create an appreciation for both the cognitive and religious significance of rituals and other behavior,” McCauley says.